Lawyer Karlo Nograles, son and chief of staff of House Speaker Prospero Nograles, distributes loan assistance to senior citizens in the village of Dumoy in Davao City’s Talomo District. DAVAO CITY, Philippines – Senior citizens in Davao City in Mindanao have received financial loans as part of a humanitarian program launched by House Speaker Prospero Nograles. The solon’s son and chief of staff, lawyer Karlo Nograles, recently led the distribution of the loans worth P150, 000 to the beneficiaries of the “Oplan Kaalam” Program. The program was jointly undertaken by the Department of Social Welfare and Development to the senior citizens of Dumoy village in Talomo District to help them start a small business. The young Nograles said the loan will be paid on several installments without interests so others may also avail of the assistance and put up their own livelihood too. The beneficiaries of the loan praised the lawmaker, who belongs to Davao City’s 1st District and his son for their assistance, saying, the money could help them start a small business and help augment their livelihood. 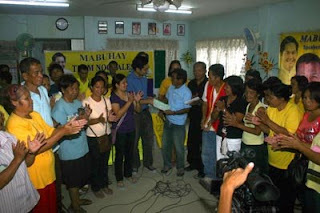 The young Nograles urged the others in the 1st District, especially the poor, to avail of the loan package simply by applying to the congressional office along Quirino Avenue in Davao City or to go to their village leaders and ask how they can benefit from various humanitarian programs of the solon.